Are you ready to throw the best Super Bowl party ever? 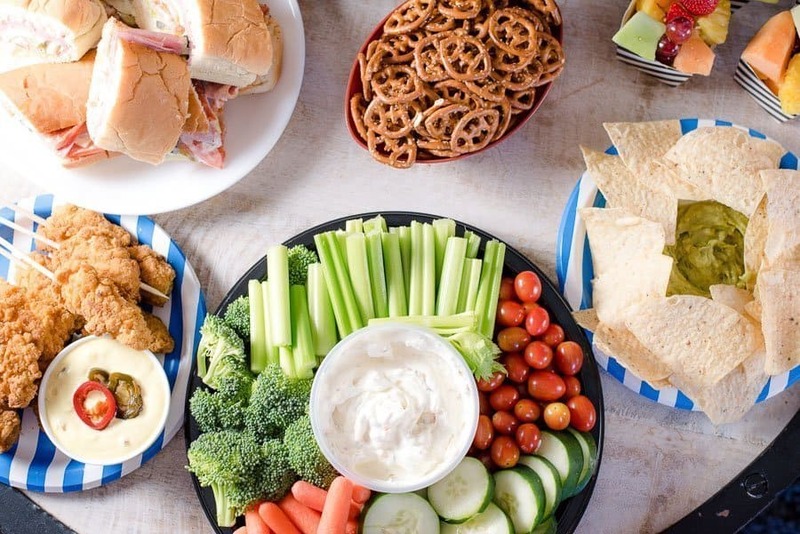 I’ve got some fun and easy Super Bowl Party Food Ideas, Decor & More that will impress your guests and reduce your stress. I’ve got my fingers crossed that my favorite Carolina team will be heading to the big game and I’m throwing a big bash. Of course, I throw a big party every year whether my team makes it or not. The commercials alone keep me glued to the TV screen. 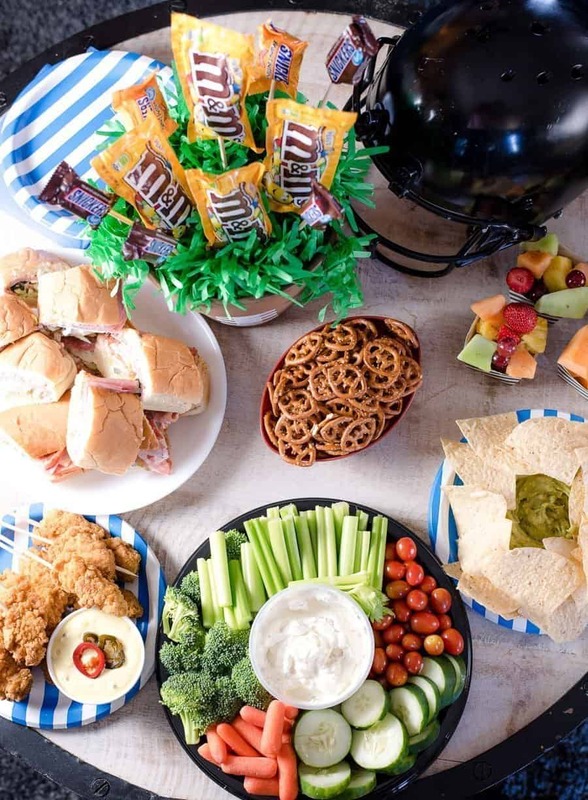 If you’ve never hosted a Super Bowl Party, have no fear, Alli’s here. I’ve got secrets galore that will have you out of the kitchen and smack dab in the middle of all the halftime festivities including a dabbin’ contest (more about that later). Remember, this is not a black tie affair so don’t go anywhere near your formal dining room and keep that china you rarely use locked up tight. It’s time to pull on your favorite team jersey, jeans or leggings, a warm pair of socks, a low or high ponytail, a little bronzer, lip gloss, mascara and you’re ready to party. Remember, we’re not going near that dining room. Think stations. Think within arm’s reach. Think coffee table. My coffee table is large and round with a crank that lifts it up or down. It can go up as high as a regular table and you ought to see how low it can go. For this party, I crank it up a tad. 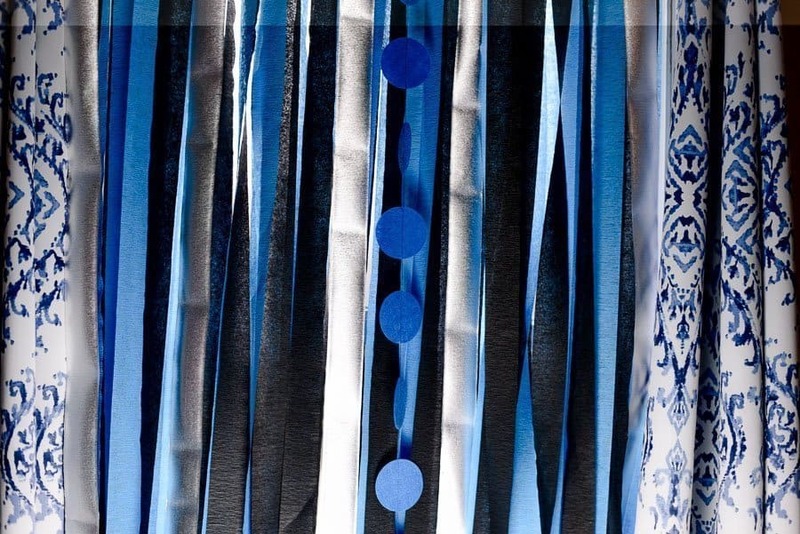 When I was at Target, I stopped by the party supply section and bought crepe paper streamers in my favorite team colors – blue, black & silver. You’ve got to have lots of color. I even found some crepe paper dots. Since my dessert station is to the right of the big screen, in front of a window, I decided to hang the streamers from the curtain rod – no tape required. 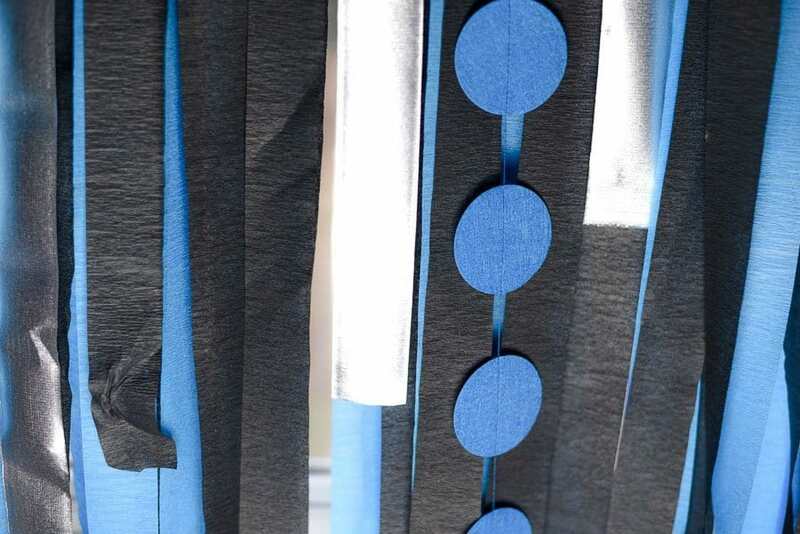 I cut a length of blue and one of black and tied the two together and repeated the pattern all the way across the window (between the open curtains). Then I added a few silver streamers and I was done. For a centerpiece, I made a candy bouquet. I found a terra cotta pot the same color as a football and added tape to mimic the lacing. I cut a foam plate down to size and inserted it in the top of the pot and covered it with a tissue paper place mat that looks like grass. Wooden skewers from my pantry were used to make the bouquet. The type candy I used was a no-brainer. All of my childhood friends know that my favorite candy ever is a tie between Snickers and Peanut M&M’s. Skittles and Starburst are my son-in-law’s fave, so I grabbed a few bags while I was in Target. 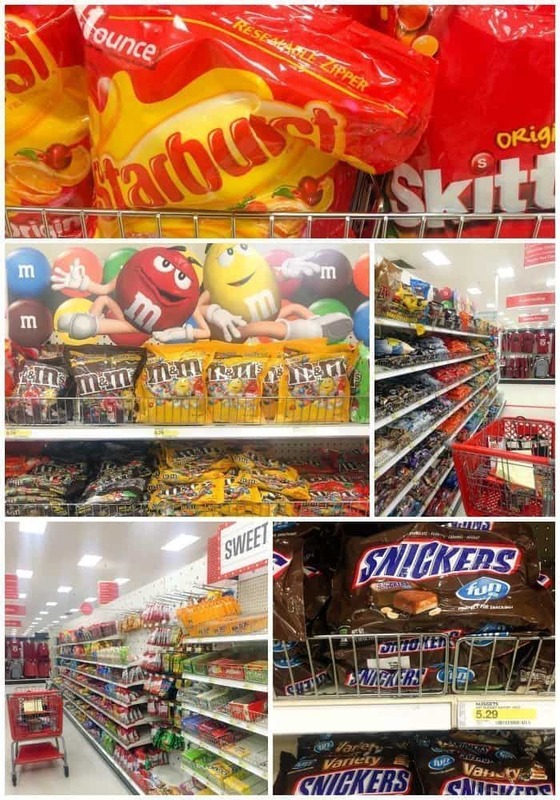 Helpful Hint: Use your Target Cartwheel App from January 17-February 6 to save on Super Snacks including M&M’s and Snickers. Everyone loves my Touchdown Snack Mix and it’s so easy to make. 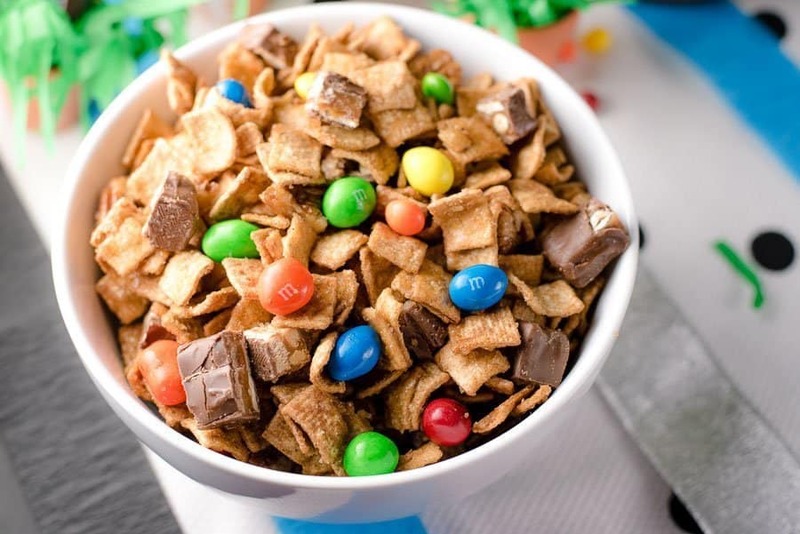 You’ll need honey graham cereal, coarsely chopped pecans, Peanut M&M’s, Skittles, Chopped Snickers and pretzel sticks. After melting the butter in a saucepan, add the brown sugar and bring to a boil on medium heat. Boil for 2 minutes. Pour over the cereal and pecan mixture. Bake the mixture in a 350º oven for 10 minutes. Cool completely and add the other ingredients. This is a big favorite at my house. Preheat oven to 350°. Combine cereal and pecans in a large bowl. Melt butter in a saucepan over medium-low heat; stir in sugar. Bring to a boil over medium heat; boil 2 minutes. Pour butter mixture over cereal mixture, and stir quickly to coat. Spread in a single layer on a lightly greased aluminum foil-lined jelly-roll pan. Bake at 350° for 10 minutes. Transfer to wax paper and cool completely (about 10 minutes). Break into pieces and toss with pretzel sticks, Peanut M&M's, Snickers and Skittles. For the cupcake toppers, you’ll need pretzel sticks and melted semi-sweet chocolate chips. 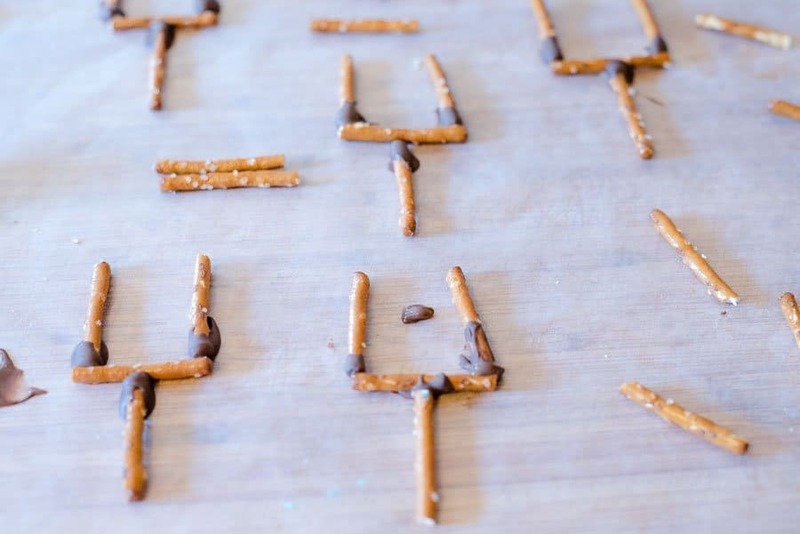 Make goal posts using the melted chocolate as the “glue” to build the pretzel sticks goal posts. 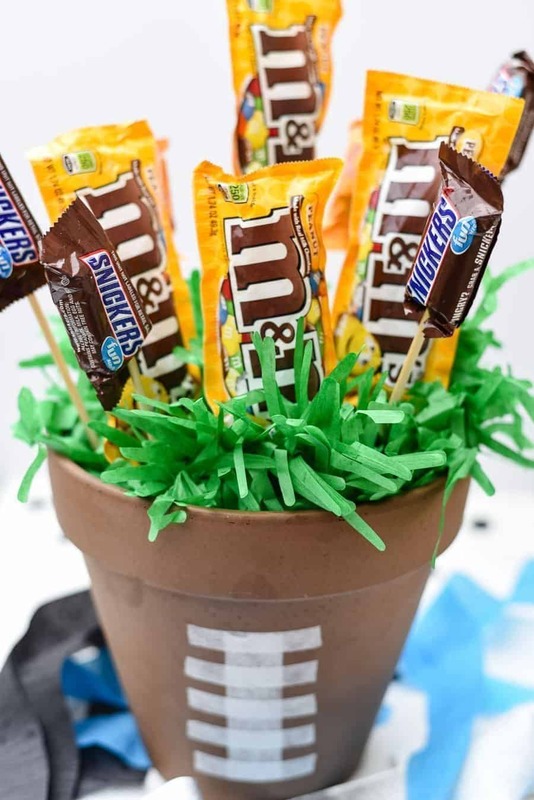 Add brown Peanut M&M’s to represent footballs. 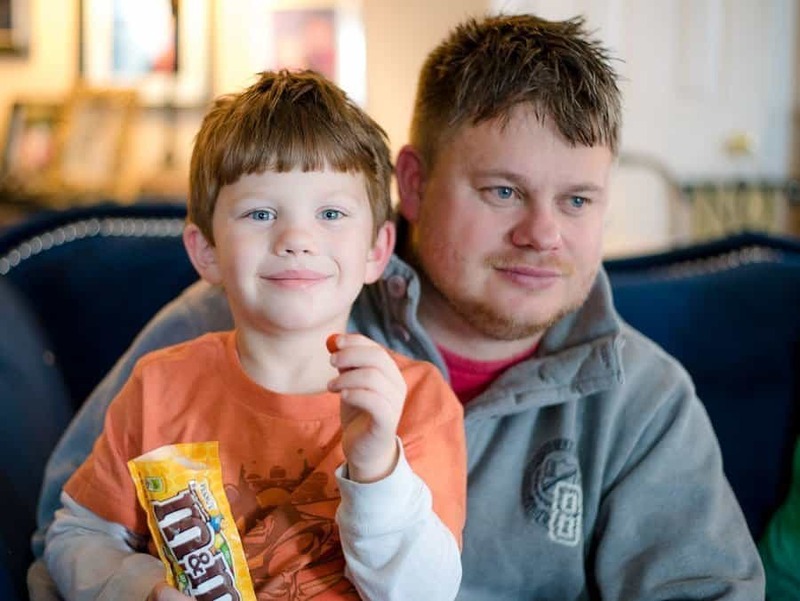 M&M’s is an Official Sponsor of Super Bowl 50! Little helmets in my team’s color finishes these cute toppers. 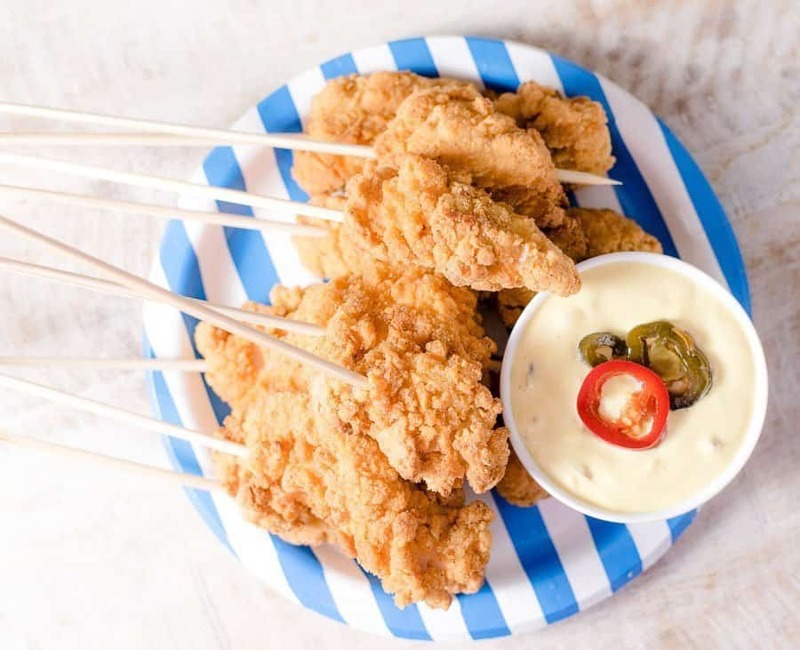 Instead of wings, I’m serving Chicken Tenders on Skewers with Jalapeño Mustard Dip. The dip is easy to whip up. Mix all the ingredients and refrigerate until ready to serve. Whisk the mayonnaise, mustard and honey together. Stir in the diced jalapeños. We all love the halftime festivities during a Super Bowl party, but you’re gonna want to pause the action in order to have a dabbin’ contest. Whenever my favorite quarterback scores a touchdown, he does a little end zone dance. You’ve got to have an end zone dance contest to see who has the moves down. The winner gets a Snickers/M&M’s Candy Bouquet and the bragging rights, of course. Oh, yeah, everyone at my party gets a mini candy bouquet to take home. 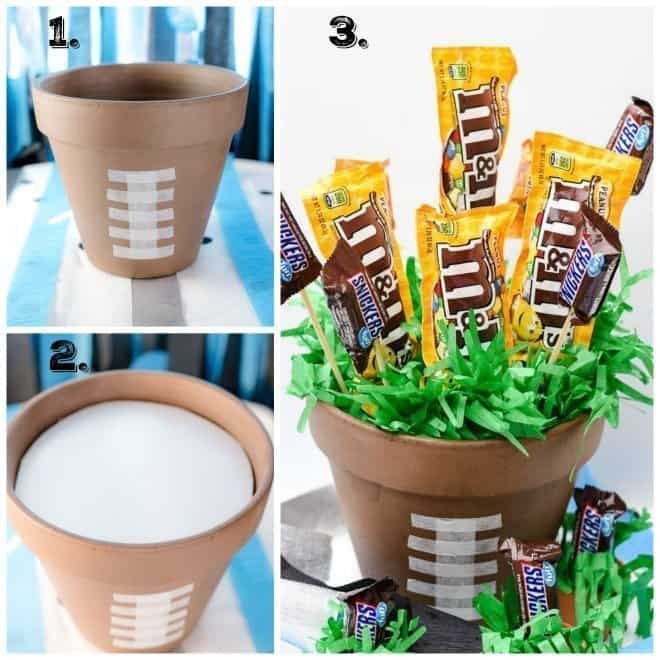 Use chalk to draw lacing onto the “football” mini terra cotta pots. Use toothpicks to secure a Fun Sized Snickers. 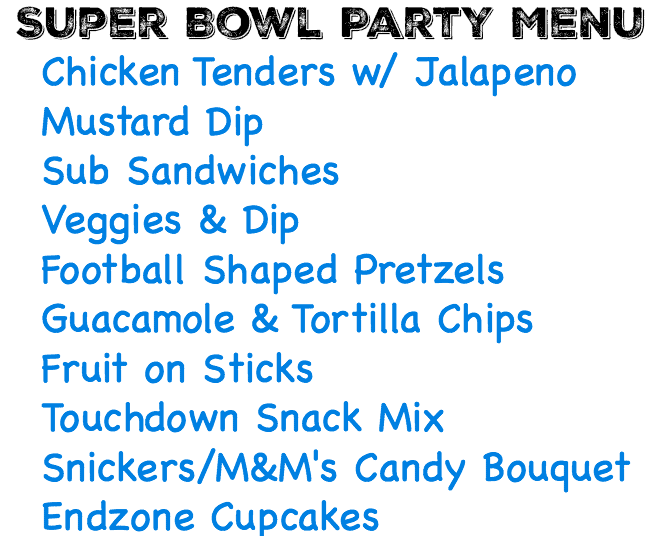 I do hope you try a few of my Super Bowl Party Food Ideas (don’t forget the end zone dance!). 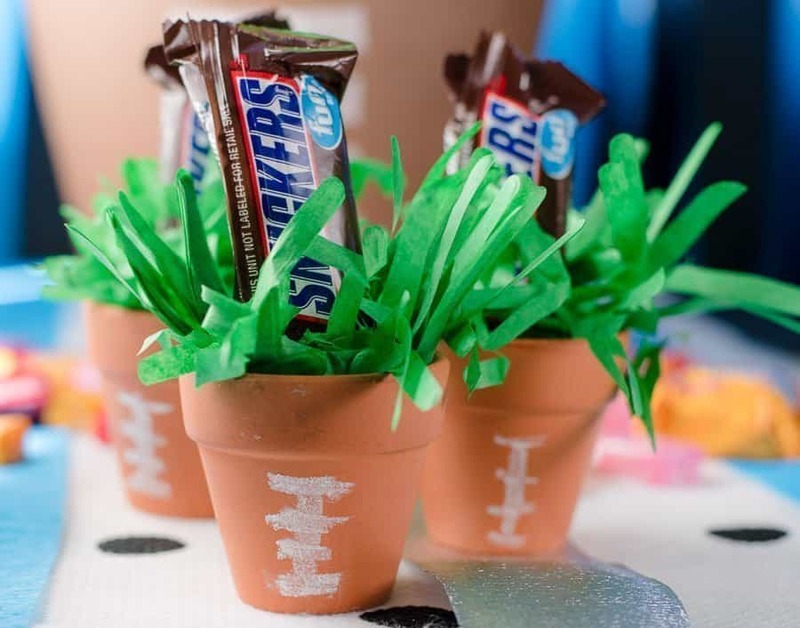 How will you sweeten your Super Bowl Party spread? Click here for more ideas! This looks like such a fun party! You did a fabulous job. 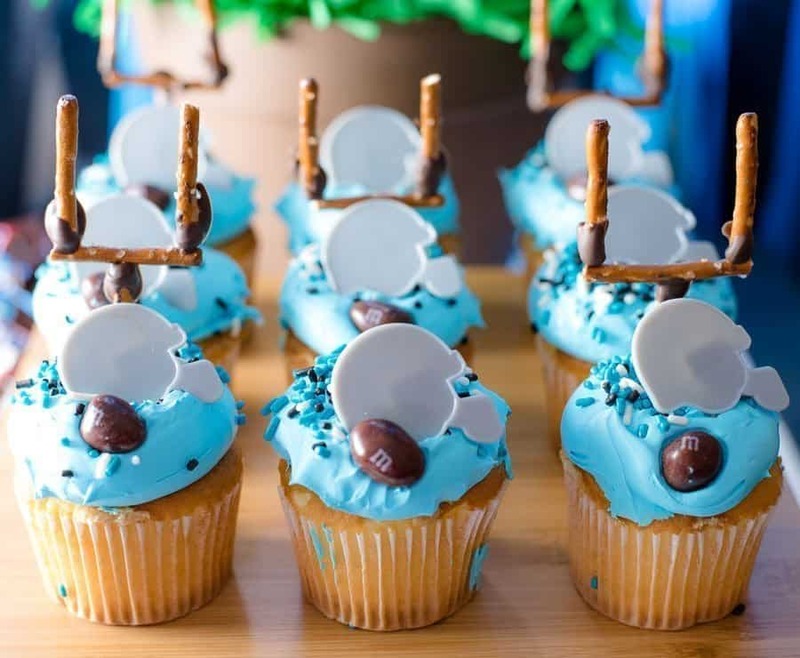 Those goal posts are sooo adorable. What a fabulous way to bring a little fun to the table! Well, now I’m hungry LOL Everything looks great! I really love the little goal posts, and how you made those flower pots look like footballs! Kristen from The Road to Domestication recently posted…Having a Hard Time Sleeping? This post kept getting better and better the more I scrolled down! I am not a football fan but after it all looks fantastic. The touchdown snack mix is something I will absolutely have to try. It makes a huge bowl and it was all eaten. It’s really, really good. 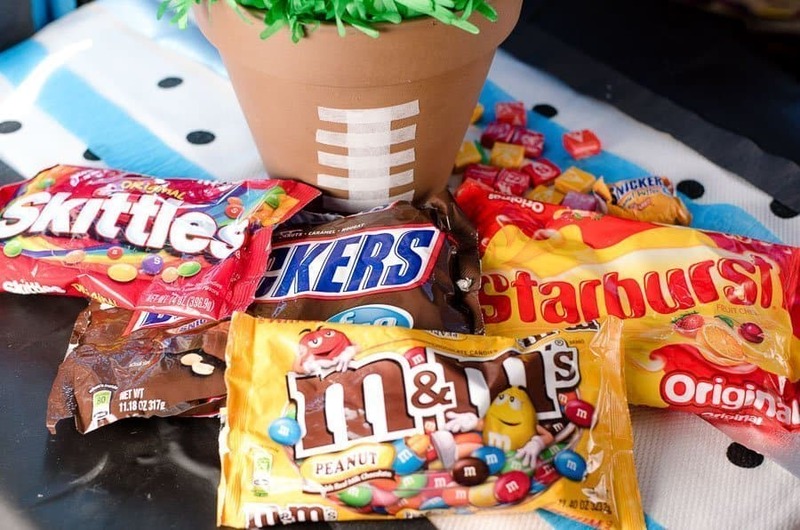 I love M&Ms and it’s nice to see it in a super bowl party idea. The other food ideas are also cool and creative. Theres so many things I love about this party set up! i think my favorite is the flower pots turned vases. Such a clever idea making them like footballs. It looks like you guys had an awesome time! We had the best time and can’t wait to do it again in a few weeks. Thanks! Are you in the Austin area, because I’m waiting on my invite lol. Great ideas for an awesome Superbowl Party. I’ll probably go to someone’s house because that’s how we do it here lol. Sorry, I’m in SC! 🙂 If you’re in the neighborhood, LOL. The football pots are so cute. Love the cupcakes too! Party over at your house!! If my husband was going to be here, I might have thought about football party food, but he will be working. I love your photos and party ideas! Thank you. This all looks so good, I think I need to come to your party! Also love the idea to hang the streamers on the curtain rod, I might use that for my next party. Thanks, Sarah! We had a blast at our Super Bowl Party (trial run) and can’t wait to do it again on Super Bowl Sunday. Your parties are always fantastic! 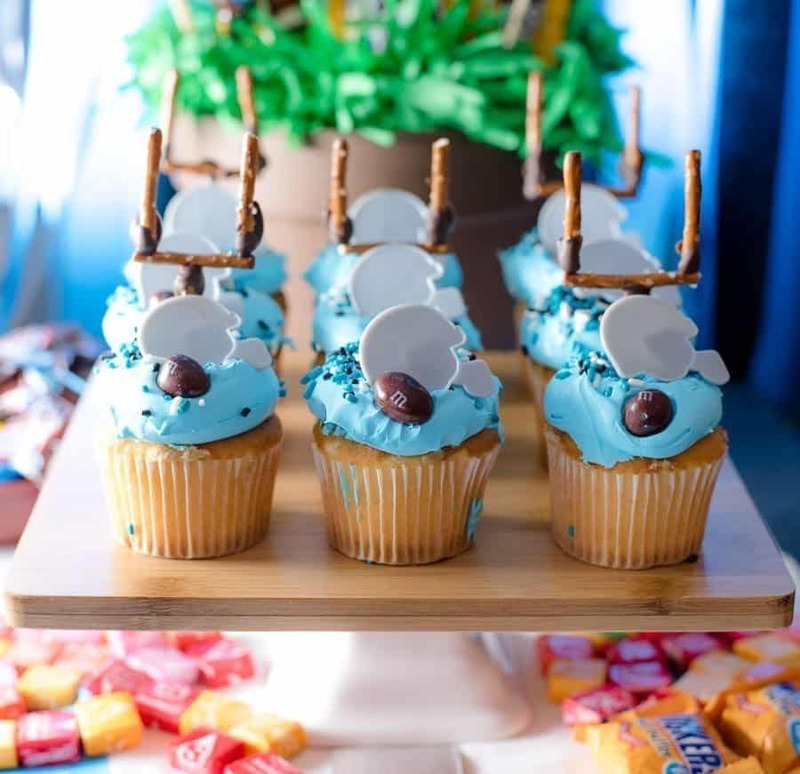 Love those Endzone Cupcakes and the Snickers/M&M Candy Bouquet…so cute! What a sweet family! 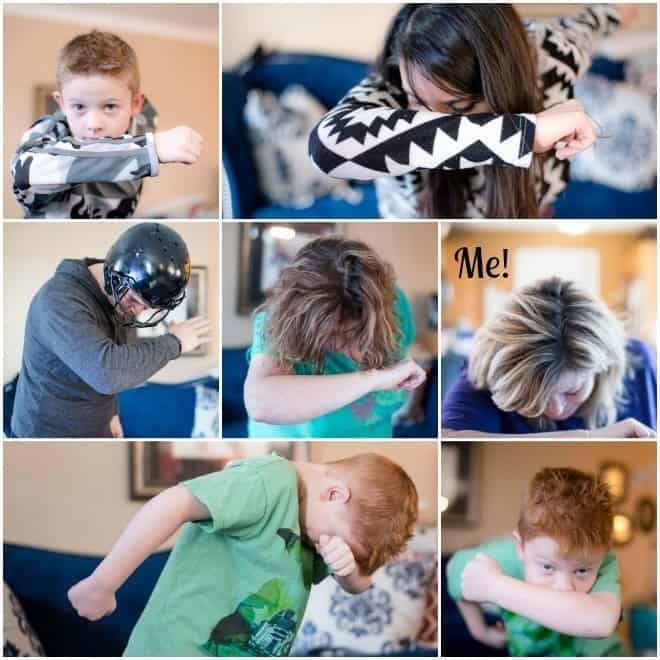 I love the family dab contest so fun! Kiwi recently posted…Sophia Amoruso Tells Atlanta How to be a Girl Boss! I confess that whenever we have sports parties I always hit the candy area! Got to have it at game days! Love the array you displayed! Oh gosh this all looks amazing. I don’t do sports, or sports parties. It’s just never been a thing for us but I think that may change as my husband has been hinting so this could be great! I so wanna be included in a super bowl party! M&Ms, Snickers, Cupcakes? I am so in! Looks so fun! I love all the food with super bowl parties and boy do I love Target! And, I think I see one of your yellow legal pads in that shopping cart, lol! 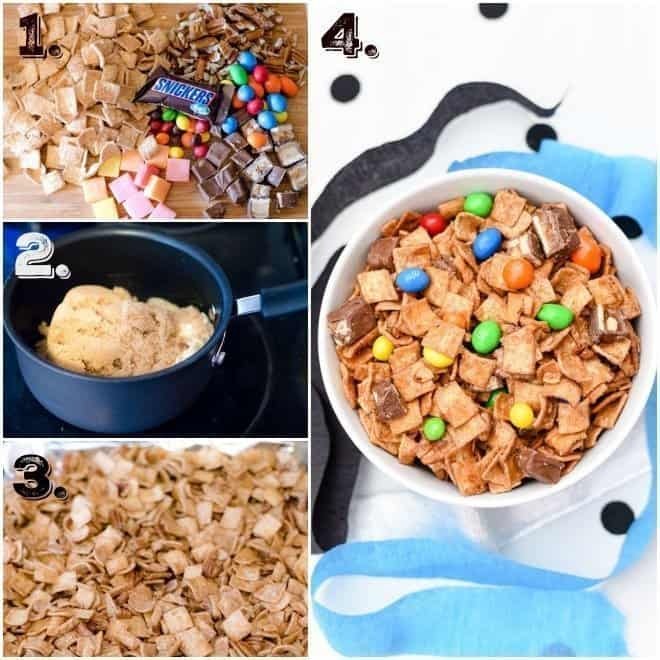 Everything looks so fun but that snack mix recipe looks especially yummy! Such a fun party. We are big NFL fans, the kind that like to hear the game but I still love the party atmosphere during the game. Yes, always lock up the fine china when drunk Uncle Tom is in town lol! 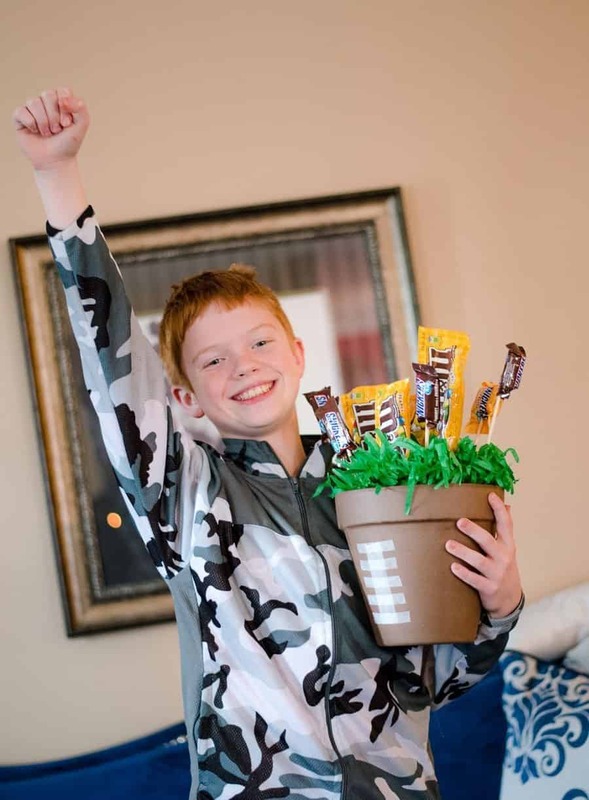 I love your party ideas and hope you guys enjoy the Super Bowl! This is a great post!! 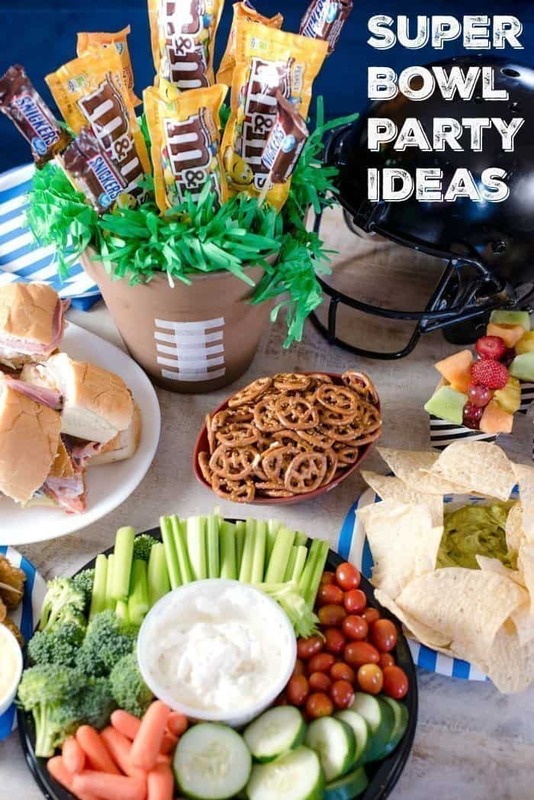 Thank you for sharing 🙂 I am so hungry after reading this blogpoost, I cant wait to try all of the above party ideas, they look amazing, super bowl looks so tasty!!! Thanks! I can’t wait to duplicate it again on Super Bowl Sunday! This post made me so hungry but I really liked it! I have also checked this https://www.ambesonne.com/curtains to create a party atmosphere! They might be a perfect match too.